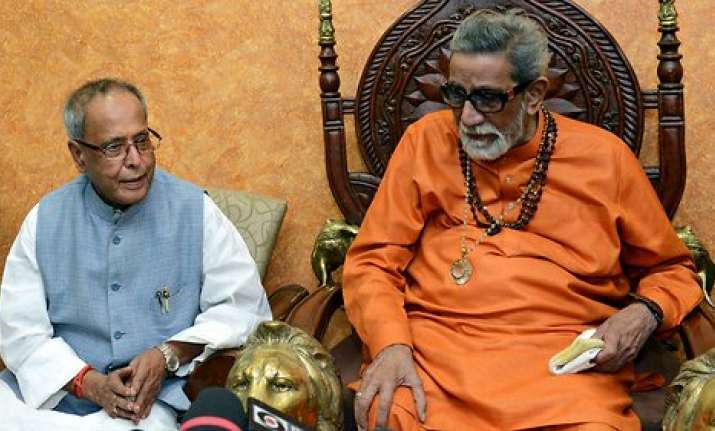 He describes his meeting with Thackeray as "very cordial" during which the Shiv Sena supremo jokingly said that it was but natural for the Maratha tiger to support the Royal Bengal tiger. Congress President Sonia Gandhi was upset with Pranab Mukherjee for meeting with late Shiv Sena leader Bal Thackeray, despite being advised by her against doing so before his election as President of India in 2012, the third volume of his autobiography has revealed. On the campaign trail, Mukherjee was visiting Maharashtra where Thackeray, who had unilaterally extended support to his candidature, had made "elaborate arrangements" for Mukherjee's visit to Matoshree, the Thackeray residence in Mumbai. Nationalist Congress Party (NCP) leader Sharad Pawar, a coalition partner of the United Progressive Alliance (UPA-II) government, had insisted that Mukherjee meet Thackeray. Mukherjee, in the third volume of his autobiography, "Coalition Years: 1996-2012", justifies his meeting with Thackeray and shows how it was aimed at keeping coalition partners like the NCP in good humour with Trinamool Congress (TMC) leader Mamata Banerjee having already abandoned the UPA. He recalls that his visit to Mumbai on July 13, 2012, was significant as Thackeray, whose party was part of the Bharatiya Janata Party (BJP)-led National Democratic Alliance (NDA), had, without being asked to, extended support to Mukherjee's candidature, which was completely unexpected. "I had asked both Sonia Gandhi and Sharad Pawar -- who was instrumental, I think, in influencing Thackeray towards me -- whether I should meet Thackeray during my visit to Mumbai. I had received several messages from him for an interaction at his residence. Sonia Gandhi was not enthusiastic about my meeting Bal Thackeray and (wanted to) avoid it, if possible. Sonia Gandhi's reservations about Thackeray were based on her own perception of his policies," says Mukherjee. He says that, expectedly, Sharad Pawar's advice was completely different. He insisted that Mukherjee meet Thackeray since he and his followers were waiting to receive the presidential candidate at his residence and had made elaborate arrangements for his visit. "Pawar added that Thackeray would consider it a personal insult if I did not meet him during my visit to Mumbai. I took a decision to meet Thackeray despite Sonia Gandhi's disapproval because I felt that the man who had broken away from his traditional coalition partner to support my candidature should not feel humiliated. I requested Sharad Pawar to take me to Thackeray's residence from the airport, and he readily agreed to do so," Mukherjee writes. "I had known Thackeray as a politician with a sectarian approach, but at the same time I could not ignore the fact that the man had gone out of the way to support my candidature," the former President says, adding that the Sena support to his predecessor Pratibha Patil in 2007 could still be explained because she was from Maharashtra. "In my case, it was his deliberate decision to support me -- he even told me that he found me distinctly different from other Congress politicians. Whatever be the reason, I thought it was my duty to thank him personally for his support. But when he returned to Delhi, he recalls, the following morning Girija Vyas called on him and informed him that Sonia Gandhi and her political secretary, Ahmed Patel, were upset about his meeting with Thackeray. "I understood the cause of their unhappiness but, as I have explained, I did what I believed was right. I had to keep in mind the sensitivity of advice of Sharad Pawar -- an important ally of UPA-II. Already Mamata Banerjee-led TMC had opted out of UPA and presidential elections. If Sharad Pawar became similarly disenchanted, it wouldn't augur well for the UPA. The UPA had two more years in office as the ruling coalition; without the effective intervention and support of its partners it would not be possible for it to complete the term," he says. He also recalls that Pawar was already unhappy over various issues and the relationship amongst coalition partners was under stress. "I did not want to give him further cause for unhappiness. However, I decided not to raise this issue either with Sonia Gandhi or Ahmed Patel, and left the matter at the stage," he says. Similarly, he recalls that Bihar Chief Minister Nitish Kumar, who was then an ally of the BJP, had promised support to Mukherjee and had asked him not to visit Bihar. "He said it would be embarrassing for him if he received me at the airport and organised meetings with his MLAs since his alliance partner -- the BJP -- would not take it kindly. He told me that since he had openly declared his support for my candidature, and Sharad Yadav had, on behalf of his party, signed my nomination papers, there was no need for my visiting Patna," he says.